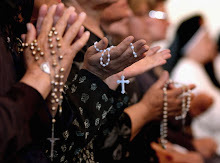 The 6pm Sunday Masses at the Church of St Alphonsus, North Ormsby, Middlesbrough, which have not taken place for several weeks, are to resume, starting on Sunday 26th January. The celebrant, Monsignor Heslin, is making a good recovery following an operation, and is now fit enough to say these Masses. Regrettably, on occasions when Mgr Heslin is not available, it will be necessary to cancel this Mass, since we have no alternative priest that we can ask to provide cover. 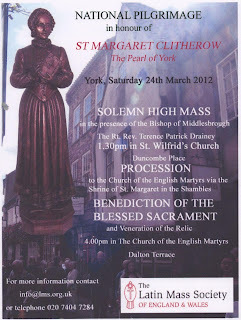 Pilgrimage in Honour of St Margaret Clitherow. A reminder that the York pilgrimage in honour of St Margaret Clitherow will take place on Saturday 24th March. It will commence at 1.30pm with a Solemn Mass in the Church of St Wilfrid, which is close to York Minster. Following Mass, the procession will set off from outside St Wilfrid's at around 3pm, and will pass through The Shambles and over Ouse Bridge to the Church of the English Martyrs where, at about 4pm, there will be veneration of the relic of St Margaret followed by Benediction. Bishop Terence Drainey will be presiding at the Mass, which will be celebrated by Fr Michael Brown. The Rudgate Singers will provide the musical setting, which will be a modern one: Missa Summi et Aeterni Sacerdotis by Jeffrey Ostrowski. This may be unfamiliar to many people, but I don't think anyone will be disappointed. There will also be music by Victoria, Bruckner, Scarlatti, De Wael (another modern composer) and Gombert. 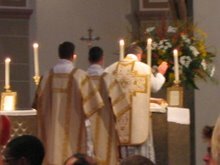 During the veneration of the relic, the congregation will be invited to sing Faith of Our Fathers, Firmly I Believe and Truely, and God of Mercy and Compassion. For Benediction the Rudgate Singers will sing the Perosi version of the O Salutaris, Bruckner's Tantum Ergo and Allegri's Adoremus. The Recessional will be the Worcester version of Laudes Regiae.